Are you struggling to keep track of employee attendance and maintain a steady workforce? Looking for an affordable web-based solution to credit your employee’s overtime hours? Well, rest assured that an efficient workforce management is just a few clicks away. With the availability of various Time and Attendance Software, employers have nothing to worry when tracking their team’s office-wide schedules. Time clock software helps you to work smarter and faster with built-in tools to connect employers and employees. What’s more? It could even be done on the go! With a variety of time clock software out there, it is extremely important to pick the one that suits your business. 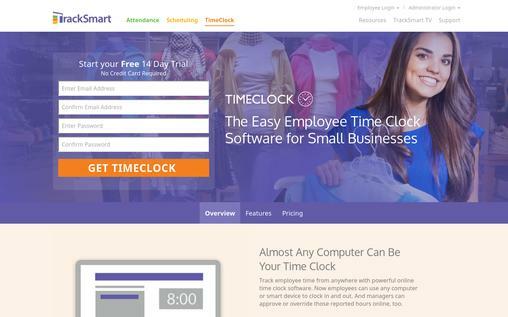 To make your search hassle-free, we did an extensive search and compiled a list of the 10 Best Time Clock Software. Check them out! 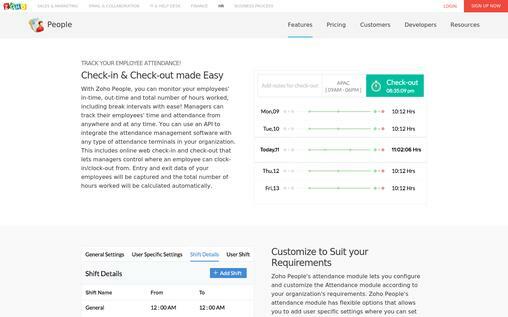 Zoho People is an interactive and user-friendly application for your Human Resource department which can monitor and record employee training, vacation and sick days within your organization, helping to boost company performance and efficiency. Employee Leave Management – It allows online leave application and reveals accurate leave reports. Attendance Management with web check-in and check-out helps to monitor employees’ absenteeism. Monitor and record job – Time tracker monitors and records employees’ job entries on a timely basis. Analyze – The performance of employees could be analyzed with Performance Appraisal which also includes features for goal tracking and setting. Employee Self Service – It allows employees to view their approvals and update their records. Live Feeds – Zoho’s live feeds allows activities and announcements to be instantly sent to employees. Compatibility – Compatible and available on iOS and Android mobile devices. Pricing – Pricing is affordable at only $199/month for a business with 100 employees but absolutely FREE for a team with 5 employees. 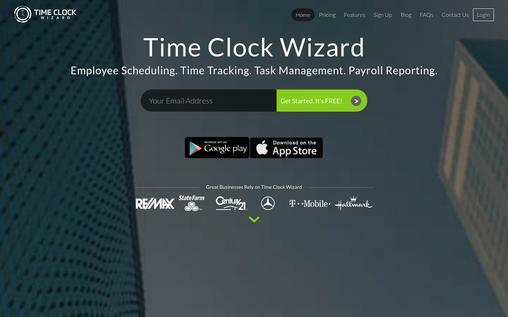 Time Clock Wizard is an online time clock and employee scheduling software. This software is 100% web based so it doesn’t require any software installation. It allows you to easily manage time at multiple venues, get payroll reports, keep track of your employee’s time and know where they clock in and clock out. Track employee time from multiple devices – the ability to track employee time anywhere, anytime and from any device. Employee Scheduling – The easy-to-use interface allows the managers to create daily, weekly or monthly schedules for employees. All-inclusive Reports – Get payroll reports, timesheet reports, Schedule reports, PTO reports, and employee contact reports. Also, the reports can be exported as Excel, Word, CSV, HTML and PDF files. Task Management – View the status and progress of the task assigned to individuals or groups. Even if you employees work remotely, independently, in-house or part of a team, the Task Management System ensures they are tracked and accomplish their goals. Mobile Apps – The mobile app allows you to conveniently track employee time even if you are away from your computer. Get a phone, chat and email support. There is a free trial of 30 days in all the plans. Pricing – The pricing plan starts at $12.95 per month for unlimited users. 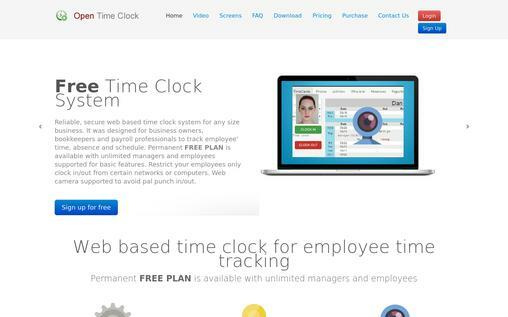 Open Time Clock is a web-based time clock software for employee time tracking. It is designed for business owners, payroll professionals and bookkeepers to track employee’s time, schedule and absence. It allows you to restrict your employees to clock in/out only from certain computers or networks. Real-Time Access – Allow your employees to clock in or out from computer or mobile device. This is perfect for businesses with multiple locations or businesses with remote employees. Easy to get started – Visit the signup page to create an account and start using the services in less than a minute. Access Control – Create a list of permitted location to avoid employee clock in from home. Access from any device – You and your employees can access from computers with Windows, Linux, Mac OS or Google Chrome OS. Also, the software can be accessed from Android, iOS, Windows, and Blackberry smartphones, iPads, and tablets. Web Camera timestamp supported to prevent pal punch in/out. Get free mail support on both free and paid plans. Free Plan – Take free forever plan with unlimited managers and employees. Also, you can take free 30 days trial of the paid plan. Pricing – The pricing plan will cost you $200/year or $30/month. Easy Clocking is a time and attendance software trusted by over 50000 companies to automate their employee attendance. This is a browser based interface which is compatible with Chrome, Firefox, Internet Explorer, and Safari browsers. It allows you to stop buddy punching and control from where and when employees clock in. Access from Anywhere – Access anytime, anywhere and get instant real-time insights to efficiently manage your company’s time attendance data. Powerful Reporting – Get a wide range of payroll reports or create your own custom reports. You can also export the reports to payroll and HR software or they can be exported to Excel. Scheduling – The easy-to-interface allows you to schedule both work time and time off. It also allows you to choose and customize Individual Schedules, Group Schedules, and Recurring Schedules. Time off Management – Allow your employees to request time off, view their own time off benefits, and stay up-to-date on changes. And the administrators can view and approve paid time off requests. Works on Smart phones – Track your employee’s jobs and task in real-time on smart phones, with GPS location precision. Online Time-sheets – Track employee’s time by task or project from your mobile or web browser. 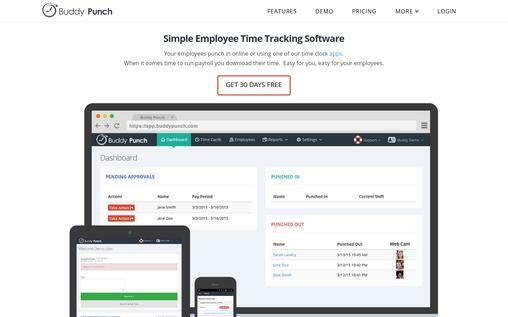 Buddy Punch is an easy-to-use and intuitive web-based time clock software for small, medium and large businesses alike. It allows you to track your employees from multiple locations, calculate OT (Overtime), get notifications, download or export reports, Google Sign On and much more. Personal Time off Tracking – Your employees can request vacation, sick time, or personal time off request on their cards and you can approve it manually or automatically. Automatic Breaks – If you need your employees to automatically be punched out after a specific amount of time, you can create a rule and assign it to a number of employees. Mobile/Tablet Ready – Allow your employees to punch in/out by using their Android and iPhones. IP Address Lock – You can restrict your employees to punch in and out from other IP address other than the specified one. Assign Managers – You can make any employee a ‘manager’ and assign him to view, approve and manage the cards of other employees. Also, you can restrict approval access of the manager. Webcam support – A photo is taken each time your employees punches in or out. GPS – Know where your employees are punching in and out from. Free Trial – There is a free trial of 30 days on all the plans. Pricing – The pricing plan starts from $29 per month for up to 9 employees. 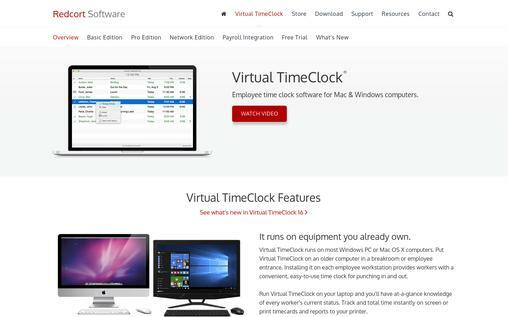 Virtual TimeClock is an employee time clock software for Mac and Windows computers created by Redcort Software Inc. It is easy to use and greatly simplifies timecard management. You can take a free trial to get started or buy a one-time license key for your software to use it forever. Install and Run – It runs on most computers and laptops with Windows or Mac OS. You can instantly track and total time on screen or print reports and timecards to your printers. Intuitive and easy to use – The clean interface allows you to easily install, setup and discover that punching in and out even if you are a non-computer user. Unbiased Time Tracking – Virtual TimeClock records the time as it occurs allowing you to track time and pay workers with accuracy. Hassle free timecards anytime – Get up-to-date timecards and comprehensive reports anytime for fast payroll processing. Free Trial – You can download and explore the program for free on your computers without any obligation. Also, you get support in the free trial. Pricing – The basic plan starts at $99 (one-time fee) for 1 computer and for up to 3 workers. 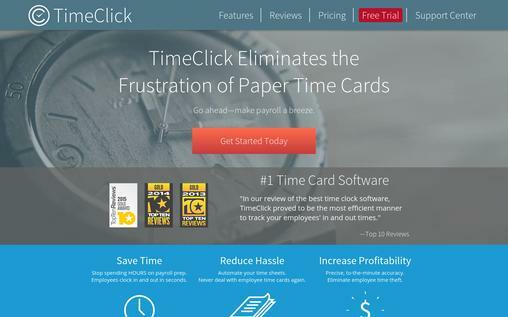 TimeClick is one of the best time clock software which is Windows based and simple to use. It is easy to install and helps you to save time, reduce hassle and increase profitability. It is more secure than cloud as it runs on your computer through your network. Modify Times – The admin can easily fix employee times when an employee clock in late or forgets to clock out. Staff Options – Here your employees can change their passwords and submit to be reviewed by an admin such as holiday, sick time, vacation and others. QuickBooks Integration – Easily get ready for payrolls with QuickBooks. Customizable Reports – The reports can be customized, allowing you to format your employees’ hours’ data any way you want. Also, the reports can be imported into your Payroll software or export to a CSV, PDF or XPS document. Free Trial – You can try it free for 30 days. Pricing – You can pay a one-time fee of $99 to get the basic time clock that runs on 1 computer for up to 4 employees. 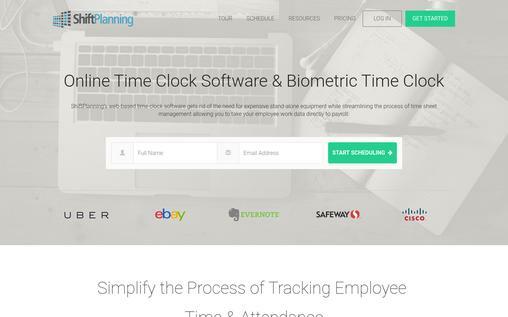 ShiftPlanning is a web-based time clock software that simplifies the process of tracking employee working hours and attendance. It streamlines the process of time sheet management and allows you to take your employee data directly to payroll. Mobile App and GPS Tracking – Allow your non-office employees to track in from any location through a mobile app. And the managers can verify clock location by using GPS tracking. Eliminate Buddy Clocking – The webcam biometric system takes a snapshot photo at the clock in/out to eliminate buddy clocking. Webcam Biometric System – It verifies genuine clocking in by taking employee snapshots. Screenshot Monitoring System – Employee performance could be monitored with the screenshot monitoring system, which provides a view of their activity on electronic devices. View Live Status – You can easily know who is currently clocked in, what they are working on and why they are clocked in. Pricing – The pricing plan starts with $45/month (pre-paid annually) for up to 20 employees. 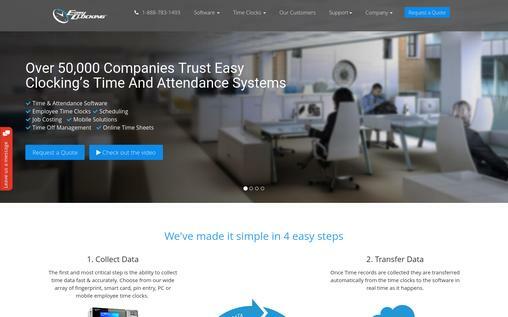 Ideal for small businesses, TrackSmart is a time clock software for attendance and scheduling that eases the task of employee data recording for administrators. Supports any Device – Any smart device or computer can be used to clock in and reported hours can be approved online too. Autoscheduler tool – This tool allows you to create employee schedules with a few clicks. Labor Cost Calculator – This is a fantastic tool to make sure employee schedules are compatible with the budget. Automatic deduction of unpaid break minutes from total employee work hours. Time-Off Requests can be submitted through the website or app and need not be submitted in paper forms for approval. Upcoming shifts and in-app messages on the employee dashboard, keeps employees reminded and connected. Free Trial – You can sign up for a free trial of 14 days. Pricing – The basic plan is priced at $22/month for up to 15 people. 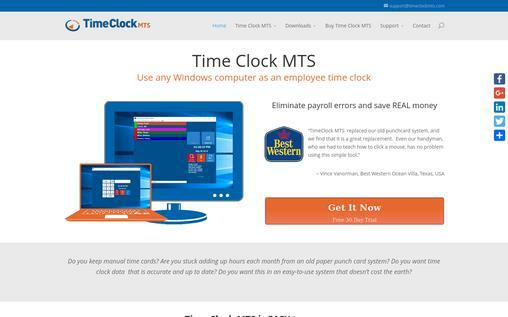 Time Clock MTS is a simple employee time clock that is compatible with any Windows computer. It provides accurate and up-to-date employee information when adding up hours for the payroll process, thereby reducing errors and saving a lot of time and money. Easy to Install – Time Clock MTS could be easily installed in a few seconds and data could be shared on many different computers. Notifications – Email notifications and prompt reports enable managers to know when employees have special requests or work overtime. The software is designed to allow employees with limited capability to clock in and out with just a few clicks. Fast Payroll Processing – Payroll processing hours will be greatly reduced as accurate timesheets are easily accessible. Advanced security features such as fingerprint security, employee PINs, and image capture prevent fraudulent behavior and encourage genuine clock punch in. Pricing – The pricing plan starts from $99 per month for a single computer and allows you to track up to 500 employees. With the growing need to manage and optimize workforce, time clock software with various simple features offers the perfect solutions to cater to the needs of various large and medium-sized businesses, helping managers and HR administrators manage employee data in no time.